Rental hut, The renovated boatyard building "Docket": bedroom sleeps 8 people/120 m2, big exhibition/conference hall, sauna. Rental hut, the two appartments "West" and "Söderholm" are situated in a one-hundred- year old house that used to accommodate pilots: Both appartments consist of a bedroom for 5 people and a kitchen. Their size is about 60 m2. The appartments can be booked separately. Metsähallitus Customer Service Number +358 20 69 2424. Rönnskär huts are for rent during the period 15.6.-30.9. Terms of reservation for the Rönnskär Huts rental hut. The rental huts can only be reached by boat. More information (no booking) +358 (0)40 595 5114. The services of the rental cottages on the island Fäliskäret are primarily aimed at the guided groups and boating people the Kvarken Archipelago. 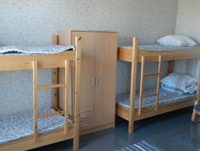 Two flats"West" and "Söderholm" as well as the boatyard building "Docket" have been renovated as accommodation areas. A dining hall for groups is also situated in the boatyard building. In the 18th century, a pilot station was established on Fäliskäret. The harbour is a popular excurison harbour. Western Finland, Ostrobothnia, Malax (www.malax.fi, in Finnish), Kvarken World Heritage Site. Rönsskär rental huts, coordinates: Euref-Fin (~ WGS84) lat: 63° 3.722' lon: 20° 48.361' ETRS-TM35FIN: N: 7007590 E: 187285. The Rönnskär rental huts are situated in the Malax municipality (www.malax.fi), on the island of Fäliskäret in the outer Bergö archipelago. The distance by boat to Fäliskäret from Replot is about 30 km and from Borgå about 23 km. The rental huts can only be reached by boat. A marked route leads to the huts. Rönnskär is featured in the excursion harbour catalogue. The closest harbour accessible by car is Bredhällan, an old fishing harbour situated on the western part of the island of Bergö. To reach Bredhällan, follow road no. 673 28 km south from Vaasa towards Malax. Then turn onto road no. 6732 toward Bergö. A free ferry connection (www.finferries.fi/en) goes to Bergö. Drive through Bergö village towards Bredhällan harbour. The harbour is equipped with a boat ramp. Vaasa is easily accessible by bus (www.matkahuolto.fi/en) and train (www.vr.fi). There is one daily bus departure from Vaasa to Bergö. The key can be obtained from the Metsähallitus office by appointment. Address: Wolffskavägen 36 F13, 65101 Vasa. You can return the key to the same place. You can also send the key back by mail. The boatyard building is equipped with electricity during the summer. The boatyard building contains a bedroom that sleeps 8 people. The room is heated by a wood-fired stove. Two pilot cottages, both with a bedroom sleeping 5 people and 2 tiled, wood-fired stoves for heating. The beds are equipped with mattresses, pillows and blankets. You should always bring your own bedclothes or sleeping bags. The boatyard building is equipped with a gas cooker and a refrigerator. The pilot cottages are equipped with a gas cooker and a wood-fired stove. The conference room is equipped with wooden tables with benches and a Flip chart. The walls of the conference room are used for a photo exhibition. A waste disposal terminal maintained by the Keep the Archipelago Tidy Association (www.pidasaaristosiistina.fi/english) is situated by the rental huts. The yard houses a dry toilet and a sheltered campfire site. Tidy up the chut before you leave. You will need to bring your own drinking water. There is a well on the island, but the water quality has not been tested. The Finnish Lifeboat Institution's shed is equipped with a fire pump and hoses. Pets are allowed in the huts. There is a marked nature on the island. There are also several unmarked trails. Keep to the trails during the period 1.5 – 15.7 in order not to to disturb the birdlife during the nesting season. Metsähallitus, Parks & Wildlife Finland. Phone +358 (0)40 595 5114.